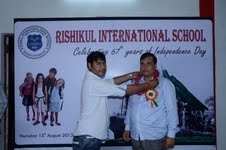 Rishikul International School celebrated the 67th national festival 15th of August 2013. > Rishikul International School celebrated the 67th national festival 15th of August 2013. > Army Public School, Jalandhar Cantt celebrated the 67th Independence Day on the 15th of August with full patriotic fervor and enthusiasm.